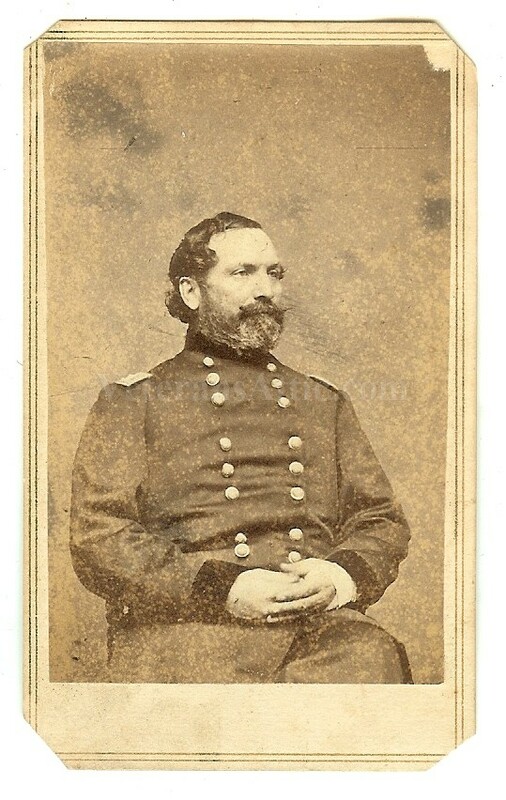 A nice image of Major General John Sedgwick, one of the most beloved soldiers in the Army of the Potomac. He graduated West Point in 1837 and served against the Seminoes and Cherokee Indians. He served under both Generals Zachary Taylor and Winfield Scott in the Mexican War and won brevets of captain and major. He was major of the 1st U.S. Cavalry and was promoted colonel on the defection to the Confederacy of R.E. Lee and William J. Hardee. He was commisioned brigadier general on August 31, 1861. He fought on the Peninsula until he was wounded at Frayser's Farm in June 1862. He was promoted major general in July 1862. He was wounded three times at Sharpsburg and was carried from the field. After his recovery he commanded the VI corps. He commanded at Chancellorsville,Gettysburg, and the Wilderness. At Spottsylvania he exposed himself to enemy fire and his aides cautioned him. His reply, "they couldn't hit an elephant at this distance," was soon followed by the whistle and thump of a sharpshooters bullet which struck him below the left eye and killed him almost instantly. This great image of General Sedgwick has him seated wearing his major general's uniform. 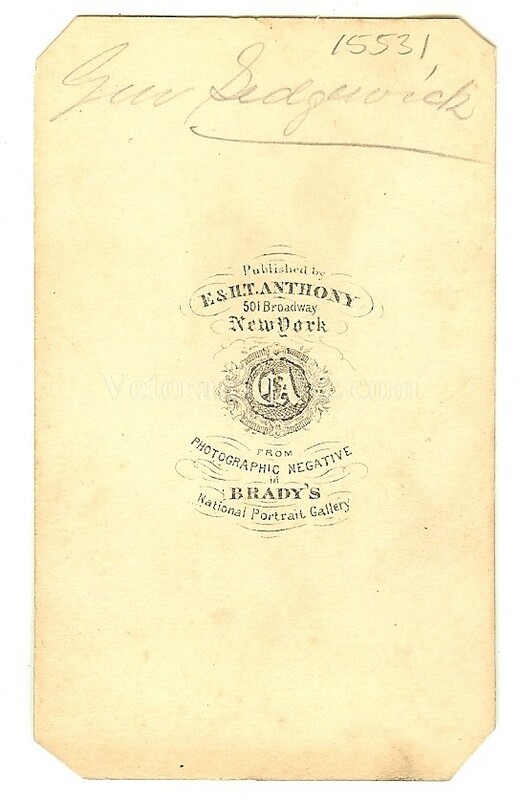 The backmark on this image is "E.&H.T. Anthony, New York". There is a a very small piece of the image missing in the upper right corner.